Four University of Toronto researchers took home three research prizes, worth a combined $75,000, at the recent launch of the RBC Research Institute in Toronto – a collaboration with U of T.
The three RBC research prizes were awarded to Glenn Gulak, Gerald Penn, Cosmin Munteanu and Varun Perumal for their work in fields that range from cybersecurity to designing machine learning user interfaces and developing novel manufacturing materials. David McKay, the CEO of Royal Bank of Canada, said Canada’s biggest bank is investing heavily in machine learning research in an effort to seize on Canada’s early lead in artificial intelligence and prevent top minds from leaving for the United States. “We believe this will be a global destination for AI and AI research,” McKay told a packed room at the official launch party for the RBC Research Institute. The institute, part of an expanding, innovation-focused partnership with U of T, is co-located at the MaRS Discovery District and U of T’s Banting and Best buildings across the street. Moments later, McKay was joined on stage by this year's RBC research prize winners, who were featured in a short video that discussed their work. Gulak, a professor in U of T’s department of electrical and computer engineering in the Faculty of Applied Science & Engineering, won a $25,000 prize for his work in developing better cyber-security systems for the financial sector. The algorithms on which the systems are based are “provably secure against the imminent arrival of quantum computers that will weaken virtually all of the attack surfaces currently secured by conventional forms of encryption,” Gulak said. Another $25,000 prize was shared by Penn, a professor in U of T’s department of computer science, and Munteanu, an assistant professor at U of T Mississauga with cross appointments in computer science in the Faculty of Arts & Science and the Faculty of Information, for their work developing better user interfaces for AI tools in the financial sector. 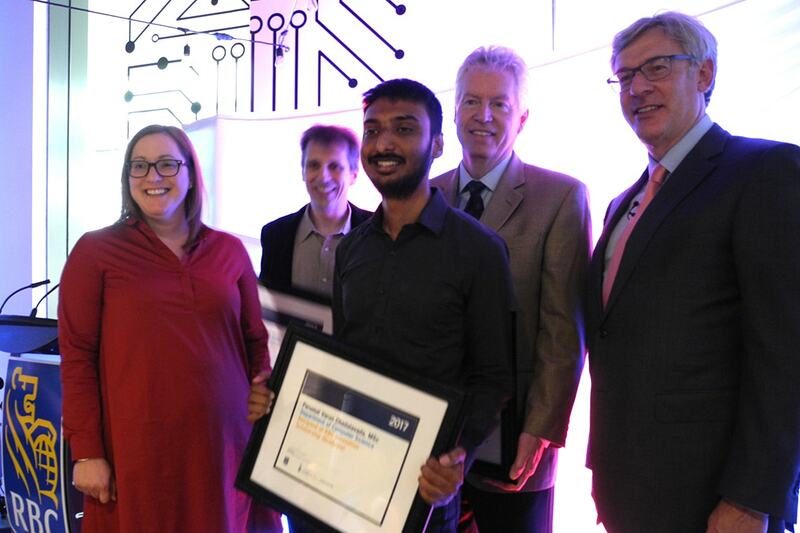 Perumal, a computer science PhD student, took home a $25,000 innovation scholarship for his work in developing new smart materials. His startup, Printem, developed a special film that can be used to make printed circuit boards – the heart of all electronics devices – in an ordinary home or office printer. RBC’s McKay noted the bank’s investments in machine learning research come alongside an unprecedented level of government support for the field. “I don’t think I’ve ever seen such a cohesive push in one area,” he said. Building on the pioneering work of people like U of T’s Geoffrey Hinton, considered the “the godfather of deep learning,” the federal and provincial governments earlier this year partnered with U of T and industry to launch the Vector Institute for artificial intelligence research. Meantime, Uber recently said it was setting up a driverless car research lab in Toronto that will be headed by U of T Associate Professor Raquel Urtasun. “It’s a really exciting time to be in this country,” McKay said. The RBC Research Institute is one of several areas where the bank is partnering with U of T on innovation-related efforts. RBC has also struck a deal with the Creative Destruction Lab at U of T’s Rotman School of Management, one of 10 on-campus accelerators, to support the development of machine learning startups, handed out $50,000 worth of prizes at a Startup Showcase event during U of T's first-ever Entrepreneurship Week in March and is working with U of T to launch a new accelerator called ONRamp later this year. Foteini Agrafioti, the head of the RBC Research Institute, similarly praised the bank for stepping up to support innovation in Canada. “RBC is one of the companies that felt responsible to act very quickly to help reverse the brain drain to south of the border,” said Agrafioti, an inventor and entrepreneur who completed her master’s degree and PhD at U of T in electrical and computer engineering.